Taqele Naiyaravoro will join Glasgow Warriors following his international commitments, contrary to reports in the Australian media, his agent has stated. 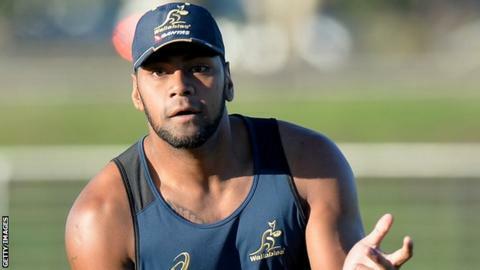 Fiji-born Naiyaravoro signed a three-year deal to join the Pro12 champions. But the 23-year-old wing's inclusion in the Wallabies' Rugby Championship squad fuelled speculation he may back out of his contract. "He's definitely coming to Glasgow to honour his commitments, at least for the first year," said Tyran Smith. A move away from Australia would rule Naiyaravoro, who is moving to Scotland from Sydney's Waratahs franchise, out of international contention. The Australian Rugby Union's policy is to pick only those overseas players boasting a minimum of 60 caps and seven years of Australian Super Rugby representation. "There's a bit of a personal family thing - he's had another baby and his wife was finding it hard for personal reasons," Smith told BBC Scotland. "She needed his support and moving away was a big decision, but he's honouring his first commitment, then we'll go from there. "He's been a little bit naive. I've heard all the reports and I've been in contact regularly with him clarifying." Naiyaravoro was not included overnight in Australia coach Michael Cheika's matchday squad for their opening Rugby Championship game against South Africa. France-based Matt Giteau, the 92-cap 32-year-old centre, has earned a recall for the Wallabies at Suncorp Stadium, Brisbane, on Saturday.